Over the past few weeks, on my blog, The Dump Stat, I have been taking a look at the Campaign Setting, Amethyst: Foundations, a new supplement produced by Dias Ex Machina and Goodman Games. Now, that I have had a chance to really look into this product a lot deeper, I would like to give it a full review. If you have already read my review of this product, over at my site, some of this might feel a bit familiar. Amethyst is a game setting that takes what we have always come to accept about the Fantastic world of D&D and blends it with a futuristic, post-apocolyptic version of the earth we know so well. The lore of the world, is both complex and fascinating, deftly mixing two worlds, the magical world of the Echan, what we see in classic fantasy, with the technological world of the Techan humans, a futurisitc version of us earthlings. However, the game is not about these two worlds living peacefully in perfect harmony, but rather about the disruption that magic has on the technological world and vice versa. But, enough with the summary, I want to get into what I liked and disliked about this setting, and the book itself. The book itself is a glorious hard cover volume that fits perfectly on my shelf beside all of my other 4e books. The Cover art is really good, as you can see above , but the back cover is just as appealing. The book is about 300 B&W pages, and contains a Character sheet and a full map of the North America region in the back of the book. The cover art is a very good example of what you will find inside. The book’s art is of incredibly good quality and takes a much more realistic tone than that of what we usually see in products put out by Wizards of the Coast. I found that the images in the book helped to add to the tone of the setting; rather than playing in a Fantasy world, we are playing in a different version of ours, so having more realistic imagery makes a big difference. My only complaint is that I would have liked to see more artwork. There were some sections of the book that were virtually void of pretty picutures. For example, the powers section in each class entry had very little art to break up what I would consider to be a very mechanics heavy part of the book. I would have liked a couple of images in that section to help illustrate some of the powers, or even just to provide something gorgeous to look at. The full page image on page 4 and all of the chapter heading art is just amazing. When you compare that with the lack of artwork in some of the sections, the book has a bit of a balance issue in this respect. The writing in this book is excellent and absorbing. I found myself getting sucked into the book pretty easily. I have very few negative things to say about the writing here. Chris Dias and his team of writers did a great job. Let’s take a look at these sections one by one. This section provides an introduction to the world and outlines what the world is really about. I found the writing here to be some of the best in the book. It clearly states exactly the kind of game you are going to be getting into when you play a game of Amethyst. Also, the Glossary section in Chapter 1 proved very useful in providing a quick place to look up important terms that are presented later in the chapters detailing the world of Amethyst. This section made it very clear to me, when reading, that we were not going to be dealing with classic fantasy when it comes to Amethyst. One of the decisions that the designers made when writing this campaign setting was that they were not going to be using any of the traditional races that are presented in WotC material; you won’t be seeing any Dragonborn here. In my opinion, this section was a big plus. 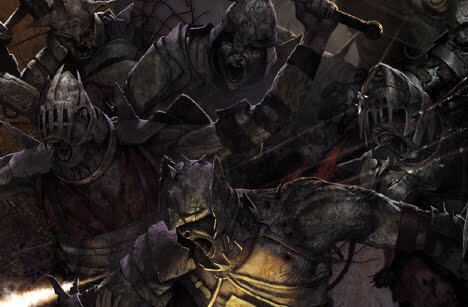 It takes a lot of work to imagine an entire world and the designers could have taken the easy way out and used the races that already exist in 4e, but instead, they developed their own races, each of which has its own unique area of focus. I liked the fact, although the races may be familiar, they are still different and separate from what we have seen so far. Rather than use the existing 4e races in conjunction with Amethyst, I have been thinking more along the lines of how I could use the races in Amethyst in my more traditional fantasy style setting. The one critique that I had of this setting was that some of the images didn’t fit the image I had in my head for the race presented. The Organizations section in this chapter, though very short, was excellent and I wanted more. I did a full post on The Dump Stat already about this section, but I really, really liked the idea of giving the player group a thematic and mechanical boost for tying their origins together. I know how many times I have had problems with players taking drastically different backgrounds and then trying to make the party fit, but this mechanic gives them a reason to all know each other from the beginning. Amethyst did something similar to Dark Sun did; they present an additional template, which you can add to your character, during creation, that gives some mechanical benefits, but also add a lot of flavor to the character. I liked these life paths a lot. Though many of them were very setting specific, I found that I could probably use a few of them as stand-alone templates in a game based in a different world. Amethyst presents several new classes for Techan characters, those that wield technology rather than magic. These classes, again, take what we know about the mechanics of 4e and twist them into something different. I really liked the multiple roles element of these classes; rather than simply assigning a single combat role, and pigeon holing a character into one specific combat style, they give them multiple roles, which to me, is how 4e should have been from the start. Good stuff here. I could see myself playing any one of these classes when I get a round of Amethyst with my players. I found this section lacking. With 4 new classes and a huge world to game in, I expected to see more Paragon Paths than that which was presented here. All of them seemed pretty solid; they gave some good Echan paths, as well as some good Techan paths too, but I wanted more of them, which, as I understand it, will be coming in the second book that is in the works now. This section presents a host of new options for Characters in Amethyst. 4 new Skills are outlined – Demolitions, Engineer, Sciences, Vehicle Operations and a new use of the Athletics skill, which seemed to be a bit out of place. The Feats in this section were great, especially all of the ones which are keyed off of the Lifepaths presented in Chapter 3. It is worth noting that the Feats for weapons and tech are great. If you want to put guns into your D&D, using the tech in this book, in conjunction with the feats and classes, is a great place to start. Of all the things that attracted me to Amethyst, technology had to be number one. Being able to run a D&D game with high-tech guns has always been something that I wanted to do. So, when I heard about Amethyst, I knew I needed to do a review of this game. The equipment section in this book is everything that I hoped it would be. You get a grand host of new toys to play with, including a range of firearms which not only covers simple, traditional guns, but also includes Vapor Rifles, Pulse weapons, Rail Guns, and all kinds of other goodies from grenades to Gaus repeaters. I could not have asked for more. The way that weapons are broken up and divided by level is also extremely well done. I loved it. Not only equipment, but vehicles are also presented here, lots of them, and they are awesome. The crunch on all of it seems very well balanced, though I admit that I haven’t had a chance to playtest it yet, but from my number crunching, it seems perfectly within the already established ranges for damage and proficiency. Oh. Did I forget to mention power armor. They did exactly what I would have done. Things like mechanical armor, take up multiple equipment slots and cost more based on the number of effects that they tie into one piece of gear. Great stuff. This section fell flat to me. I felt like it could have easily been rolled into other sections of the book. Although the presentation of new rituals is great and dandy, I think organizationally, that this section could have been totally broken up separated. Though the section was very short, it does present some valuable information to support the setting. These two chapters cover all that you need to know about the world of Amethyst and there is a lot of world to learn about. I particularly liked the descriptions of all of the Bastions that are described here. I don’t want to get into summary here, but I will say that these sections give you everything you need to know in order to run a great sandbox game. I wanted NPC’s though. There were not a lot of big names provided to match all of the big story presented here. It would have been nice to have some figures, names, etc. to go with the giant world that is Amethyst. The problem that I had here is that with rejecting a lot of the traditional races and monsters in 4e, Amethyst rejects a lot of the current beasties available; this section was just not long enough. The choices in creatures in Amethyst are very limited, which means that you are going to have to go into the other 4e books to find creatures to put up against the players, if you intend to have creatures in combat, without getting too repetitive. I had no problems with the creatures that were in the book. Cancer Dragons?! Awesome. But, I wanted more in this case as well. The adventure ideas here were great. This wasn’t a long section, but it was a good one. However, my caveat to this is a matter of priority. I think a few hooks in this section would have been enough for me. I don’t think this section needed to be quite this long and with areas, like that on Monsters, and the section on Organizations being pretty small, I think emphasis could have been put on those areas and this section could have been skipped. It wasn’t bad, I just think that it could have been better suited elsewhere. Wrapping things up, I think Amethyst is a really great product. I would buy this book just for all the rules on guns and equipment. The book is priced right alongside all the other products for 4e that are out there and this book is a lot more content heavy than most. But, the book does have a few minor issues. Several sections seemed to be a bit long and over-specific, while others seemed to be a bit short. I would have loved to see more monsters in this book and maybe a little bit less about adventures, but these minor complaints are exactly that, minor, I give this book a 5 out of 5. I look forward to the next one, which I think will solve a lot of the issues that I found with Foundations… i.e. wanting more and more of it. Awesome! I think I may be try to get my hands on a copy of this based on your review. Campaign settings sadly end up as little more than glorified reading material for me, but hey… I don't really mind. I'm still trying to get an Eberron or Dark Sun game off the ground. C'est la vie!